42g Banana Powder Luxury Natural Face Loose Powder 1.5 oz Bottle Brighten Powder. 1 PCS x 42G Banana Powder. 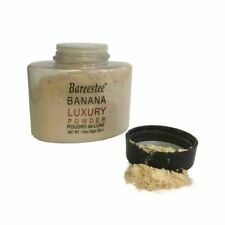 Banana powder gives a smooth finish over foundation while reducing shine and setting makeup. Description: This full-sized high-quality Translucent Loose Setting Powder is suitable for a range of skin tones. This non-comedogenic oil-free fixing powder has a silky texture that allows smooth, even application. Its lightweight character means that it sits on top of fine lines, subtly softening these. Use it without makeup for a matte look, or to lock in makeup and create long-lasting wear. Features: ---Shade: Translucent / Neutral ---Size: Full size ---Condition: Brand new sealed powder in box (factory 2nd - box may be slightly damaged) ---Effect: Setting ---Formulation: Loose powder Benefits: ---Non-Comedogenic ---Oil-Free ---Hypoallergenic ---Long Lasting ---Suitable for all skin types ---Suitable for all skin colours. LANA Foundation Powder ULTRA-LIGHT vittamin E SPF 35 PA+++ 13 g.
Authentic pedestal, open to see the shiny black powder. Smooth foundation, light texture. The box face has a thin floral pattern. Adjust skin color to brighten, conceal wrinkles, not fall into the groove. All testers are sold unused, with the entire original quantity in the container. Loose setting powder. New - ( the box may have wear/tear from shelving) 100 % Authentic. An ultra-soft powder that magically transforms skin to look poreless & pixel perfect?. The WUNDER2 PERFECT SELFIE HD Photo Finishing Powder, from the makers of WUNDERBROW, creates the ultimate finish to your make up look, without the use of a photo filter.